I was thinking about how boring traditional tombstone exhibition labels can be. Not always, but often. But labels hold all the narrative power. 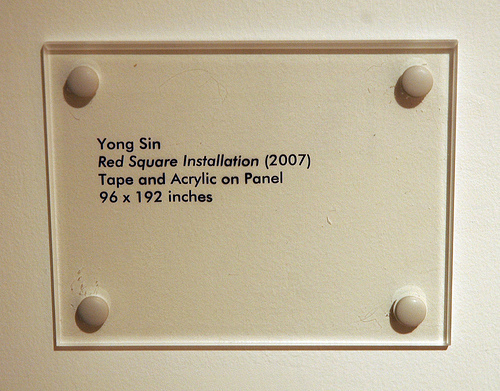 As easy as they are to skim or skip over, labels are the voice of an exhibition. So I was thinking about some alternative label concepts, which would inevitably transform an exhibition. 1) WHY IS THIS BAD? Even the most renowned master painters produce(d) “bad” work. They say late Renoir is bad Renoir, and Picasso’s Etreinte is definitely not one of his best. Artists, art historians, and curators might be able to spot them, but probably not the casual museum visitor (ignoring the fact that they probably wouldn’t be on display in the first place). So I want to see an exhibition of “bad” works, and I want the labels to tell my why they’re bad, whether it be the artistic technique, the subject matter, or some other factor. 2) WHAT’S IT WORTH? How about labels with nothing but the dollar value? It’d be an interesting commentary on the art market and blockbuster artist values. I’ll think of some more.